How much better life would be if we could all be grateful for all that we are blessed with. Again, being from Aish, it takes a Jewish perspective, but you don't have to be Jewish to understand its message. Making something of beauty out of what we do have, incomplete as it may be. The Mussar teachings on the attitude of gratitude are tough, because they don't let us feel sorry for ourselves, no matter how little we may have. One Mussar master began a talk with a thump on the table and the words, "It is enough that a human being is alive!" Then he ended his talk right there. There is a story -- maybe an urban legend, but full of truth nonetheless -- concerning the famous violinist Itzhak Perlman. One evening, Perlman was in New York to give a concert. As a child he had been stricken with polio and getting on stage is no small feat for him. He wears braces on both legs and walks with two crutches. Perlman crossed the stage painfully slowly, until he reached the chair in which he seated himself to play. No sooner had he finished the first few bars than one of the strings on his violin snapped with a report like gunshot. At that point Perlman was close enough to the beginning of the piece that it would have been reasonable to bring the concert to a halt while he replaced the string to begin again. But that's not what he did. He waited a moment and then signaled the conductor to pick up just where they had left off. Perlman now had only three strings with which to play his soloist part. He was able to find some of the missing notes on adjoining strings, but where that wasn't possible, he had to rearrange the music on the spot in his head so that it all still held together. "Sometimes it is the artist's task to find out how much beautiful music you can still make with what you have left." Perlman raised his bow to signal for quiet. "You know," he said, "sometimes it is the artist's task to find out how much beautiful music you can still make with what you have left." We have to wonder, was he speaking of his violin strings or his crippled body? And is it true only for artists? We are all lacking something, and so we are all challenged to answer the question: Do we have the attitude of making something of beauty out of what we do have, incomplete as it may be? The Hebrew term for gratitude is hikarat hatov, which means, literally, "recognizing the good." Practicing gratitude means recognizing the good that is already yours. If you've lost your job, but you still have your family and health, you have something to be grateful for. If you can't move around except in a wheelchair but your mind is as sharp as ever, you have something to be grateful for. If you've broken a string on your violin, and you still have three more, you have something to be grateful for. When you open up to the trait of gratitude, you see clearly and accurately how much good there is in your life. When you open up to the trait of gratitude, you see clearly and accurately how much good there is in your life. Gratitude affirms. Those things you are lacking are still there, and in reaching for gratitude no one is saying you ought to put on rose-colored glasses to obscure those shortcomings. But most of us tend to focus so heavily on the deficiencies in our lives that we barely perceive the good that counterbalances them. There is no limit to what we don't have and if that is where we put our focus, then our lives will inevitably be filled with endless dissatisfaction. This is the ethos that lies behind the great biblical proverb, "Who is rich? Those who rejoice in their own lot" (Pirkei Avot 4:1). When you live charged with gratitude, you will give thanks for anything or anyone who has benefited you, whether they meant to or not. Imagine a prayer of thanks springing to your lips when the driver in the car next to you lets you merge without protest, or when the water flows from the tap, or the food is adequate? When gratitude is this well established, it is a sign of a heart that has been made right and whole. Gratitude can't coexist with arrogance, resentment, and selfishness. The Hasidic teacher Rebbe Nachman of Breslov writes, "Gratitude rejoices with her sister joy and is always ready to light a candle and have a party. Gratitude doesn't much like the old cronies of boredom, despair and taking life for granted." To what and whom should we feel thankful? In the Torah, when Moses brought the plagues onto Egypt, he wasn't the one who initiated turning the Nile River into blood and bringing frogs from the river. His brother Aaron invoked those plagues. The medieval commentator Rashi explains that since the river had protected Moses when he was an infant, he could not start a plague against it. God was teaching Moses a powerful lesson in gratitude: we can open in gratitude even to inanimate objects. Whenever Rabbi Menachem Mendel, the Kotzker Rebbe, replaced a pair of worn out shoes, he would neatly wrap up the old ones in newspaper before placing them in the trash, and he would declare, "How can I simply toss away such a fine pair of shoes that have served me so well these past years!?" I felt the same way when I gave away my 1984 Honda that had ferried me so reliably for 18 years. The Mussar teacher Rabbi Eliyahu Lopian (1872 - 1970) was once talking to a student after prayers, and at the same time was folding up his tallis [prayer shawl]. The tallis was large and he had to rest it on a bench to fold it. After he had finished the folding, Reb Elyah noticed that the bench was dusty, and so he headed out to fetch a towel to wipe it off. The student to whom he was speaking realized what Reb Elyah was doing and ran to get the towel for him. Reb Elyah held up his hand. "No! No! I must clean it myself, for I must show my gratitude to the bench upon which I folded my tallis1." If we can be grateful to rivers, shoes, cars, and benches, which help us involuntarily, how much more so to human beings who have free will and who help us consciously out of the goodness of their hearts? Or to the mysterious source out of which our lives have come? When Leah, wife of the patriarch Jacob, had her fourth child, she named him "Yehudah," which means, "I am grateful," to reflect her gratitude to God for the gift of another son. The name Yehudah is the source of the Hebrew name of the Jewish people (Yehudim), revealing the very direct tie between Judaism and gratitude. Gratitude opens the heart and that's why it provides a fine orientation equally to the inanimate, human and divine dimensions of the world. A simple and effective way to practice gratitude is by making giving thanks part of your everyday life. For example, it is an established Jewish practice to recite 100 such blessings a day. The term for "blessing" in Hebrew is bracha, which comes from the same root as the Hebrew word for "knee." When you say a blessing, it is as if you have bent your knee in an act of gratitude. The habit of saying blessings can remind you to be thankful when you hit a green light, or the salad is fresh, or the garden is getting the rain it needs, or your child came home from school as usual. Can you see how such a practice might slowly but insistently change your orientation to the world and your life? 1. from Reb Elyah by David Schlossberg, p.121. While Carol continues on the Grand Tour of Europe, she is obviously too busy to be posting her second week and maybe third week of travels. I just thought I would give a comparison of the costs and benefits of being in the States versus being in Europe. 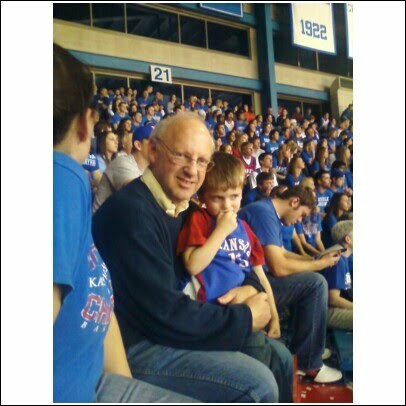 KU Basketball game at Allen Fieldhouse ................................Priceless!!!!! In an era of unwieldy titles, Jackie Kulesza may be one of the few agency executives who isn’t dragging a freight train of modifiers in her wake. While overstuffed job descriptions have become the norm, Kulesza’s title befits her forthright manner. As senior vp, broadcast activation director of the Chicago-based media agency Starcom, Kulesza, 37, places billions of national TV dollars for a roster that includes Allstate, Bank of America, Hallmark Gold Crown, Nintendo and Kellogg’s. Much as she loves the art of the deal—ad sales execs say the mental toughness the media buyer brings to the table is matched only by her equanimity—Kulesza is less concerned with the immediacy of price than in ensuring that her clients’ messages find their way to the right screen, and at the right time. Take, for example, an integration Kulesza engineered for Hallmark a year ago. As the client was readying the launch of a new line of recordable greeting cards, Kulesza worked out a deal to showcase the novelty offering in the sixth season of ABC’s Extreme Makeover: Home Edition. Midway through the Dec. 7, 2008, episode of Extreme Makeover, Hallmark played a part in helping a group of young music students stay in touch with their teacher who suffers from a rare heart condition. Dipping into a box of recordable cards donated by Hallmark, each student created their own greeting, wishing her well and letting her know that she was missed. Besides providing Extreme Makeover with one of its signature Kleenex-depleting moments, the Hallmark integration stands as a prime example of how Kulesza continues to help her clients bust through the cluttered TV space. This year, Kulesza and her team joined forces with Nickelodeon, taking the wraps off a cooperative research effort on how the recession has affected family spending patterns and consumer-brand relationships. Chief among the study’s findings was the assertion that consumers were beginning to question their long-standing brand loyalties. The joint study also suggested that the drain on dollars has had an impact on media consumption. For example, there has been a significant uptick in co-viewing habits, as reduced entertainment budgets have encouraged parents and kids to watch more television together. With all that is going on both in the area of politics and religion, this poem came to mind. As it is said, “It is an oldie but a goodie.” I hope that you will take a little more time and read my commentary at the end. What is wrong with the Human Psyche? What is it that obsesses people to think that everyone else has to think and believe as they do? This poem talks about religion. What is it about religion that members believe that theirs is the only answer. I am going to over simplify here a little. Muslims believe that the only way is through Allah. Christians believe that the only way to Heaven is through Jesus. Jews believe that they are the Chosen People. Having these beliefs would not be so bad except people kill other people who do not believe as they do. OK, so if you are Muslim, or Christian or Jewish you believe that you have the only answer. But wait a minute. Which denomination is the right one? Shiite Muslims hate and kill Sunni Muslims. Catholic Christians fight with Protestant Christians and vice versa. Orthodox Jews think that Conservative and Reform Jews are blasphemers. Then there are groups within the groups within the groups. In our Democracy, apparently politics has joined religion in vilifying the opposition. If you do not see the world or important issues as I do, then you must be evil. The Republicans condemn the Democrats and the Democrats condemn the Republicans. What happen to the ideals of “Love your neighbor as yourself,” “Do unto others as you would have them do unto you.” “Turn the other cheek.” No we have to have gotcha politics. We have to call the opposition, stupid or evil. They don’t care about this victim or that one that we consider important. Why can’t we just say that we disagree with their message or their proposal? Why can’t we discuss in a civil manner and work for just solutions. I just do not understand. Like religion, in politics there are groups within groups. Abortion seems to be the topic on both sides that brings out the strongest beliefs. In the Republican Party, if you are not Pro-Life, 1000 percent, you are not a REAL Republican, You are a RINO (Republican in Name Only.) I do not know about different types of Democrats but I remember some prominent Democrat not being allowed to speak at their national convention because that person was not Pro-Choice. I found this article from Aish.com very interesting. Being from Aish, the article takes a Jewish perspective that probably applies to other religions as well. My favorite part is how fundamentalists believe that they have all of the answers while faith is about expanding our understanding. Judaism is a religion of questions. Isidore Rabi, winner of a Nobel Prize for physics, was once asked why he became a scientist. He replied: "My mother made me a scientist without ever knowing it. Every other child would come back from school and be asked, 'What did you learn today?' But my mother used to say, 'Izzy, did you ask a good question today?' That made the difference. Asking good questions made me into a scientist." Judaism is a religion of questions. The greatest prophets asked questions of God. The Book of Job, the most searching of all explorations of human suffering, is a book of questions asked by man, to which God replies with a string of questions of His own. The earliest sermons usually began with a question asked of the rabbi by a member of the congregation. Most famously, the Passover Seder begins with four questions asked by the youngest child. So I can identify with Rabi's childhood memories. When I left university and went to Israel to study in a rabbinical seminary, I was stunned by the sheer intensity with which the students grappled with texts. Once in a while the teacher's face would light up at a comment from the class. "Du fregst a gutte kashe," he would say (you raise a good objection). This was his highest form of praise. Rabbi Dr. Abraham Twerski tells of how, when he was young, his instructor would relish challenges to his arguments. In his broken English he would say: "You right! You a hundred prozent right! Now I show you where you wrong." Religious faith has suffered hugely in the modern world by being cast as naive, blind, unquestioning. The scientist asks, the believer just believes. Critical inquiry, so the stereotype runs, is what makes the difference between the pursuit of knowledge and the certainties of faith. One who believes in the fundamentals of a creed is derided as a fundamentalist. The word fundamentalist itself comes to mean a simplistic approach to complex issues. Religious belief is often seen as the suspension of critical intelligence. As Wilson Mizner once put it: "I respect faith. But doubt is what gets you an education." To me, this is a caricature of faith, not faith itself. Questions testify to faith -- the universe is not impervious to our understanding, life is not chance. What is the asking of a question if not itself a profound expression of faith in the intelligibility of the universe and the meaningfulness of human life? To ask is to believe that somewhere there is an answer. The fact that throughout history people have devoted their lives to extending the frontiers of knowledge is a moving demonstration of the restlessness of the human spirit and its constant desire to transcend, to climb. Far from faith excluding questions, questions testify to faith -- that the world is not random, the universe is not impervious to our understanding, life is not chance. That, I suspect, is why Judaism encourages questions. On the phrase: "Let us make man in Our image, according to Our likeness," Rashi, the 11th-century biblical commentator, says: "This means, with the power to understand and to discern." Critical intelligence is the gift God gave humanity. To use it in the cause of human dignity and insight is one of the great ways of serving God. When faith suppresses questions, it dies. When it accepts superficial answers, it withers. Faith is not opposed to doubt. What it is opposed to is the shallow certainty that what we understand is all there is. Since I won’t be invited to be a guest blogger at peterthals (www.peterthals.com), I thought that I should blog on my week. While other members of the family are away living the high life of the Grand Tour of Europe, some of us have to stay home and take care of the mundane things here. Get up at 4:45 am and take Carol to the Airport. Back home to catch a little more sleep. Up at 7:00 to let Max out to go potty. Feed Max and then me. Take Max to Dog park. Let Max out to go potty. Feed Max and then eat dinner. Take Max for a walk. Up at 5:30 am to let Max go potty. Lunch at Qdoba with my brother. Come home to let Max out to go potty. Take Max back to work. Bring Max back home and return to work. Are we seeing any pattern yet? Well so much for the exciting life. Just think, if it wasn’t for Max I wouldn’t have anything to do. If you want to read about adventures in Europe just follow Carol on the peterthal blog. If you want to have someone who is warm and affectionate cuddle up with you every night, give you a slobbering bath and put a cold nose on you when you're least expecting it, just stay tuned here for my adventures while mommy is in Zurich.